Home / Handy Hints / Kitchen / How Much Does an Average Kitchen Cost in 2018? We’ll Tell You! How Much Does an Average Kitchen Cost in 2018? We’ll Tell You! Published: July 30th, 2018 by Simon. Filed in Kitchen and tagged Kitchen Renovation. Are you planning on renovating your kitchen or building a new kitchen this year? If you are, then I bet you’re trying to calculate how much a new kitchen will cost you. While you may be searching the internet for estimates, your preferences and the products you choose will really determine your expenses. As the head of purchasing at Ross’s Discount Home Centre, I often meet customers looking for kitchens in Perth. Over the years, I have come to know the exact factors that determine the cost of a kitchen. Today, I will share some of my knowledge with you. So, continue reading this post as I discuss the costs associated with building a kitchen in 2018. I’ll also discuss some of the findings from Houzz’s 2018 Australia Kitchen Trends Study to help you make a better estimate. Make sure to read through till the end! Houzz reports that homeowners spend about $19,300 for average kitchen renovations here in Australia. This includes an average cost of $22,600 for large kitchens over 10 square metres and $14,600 for small kitchens less than 10 square metres. The study also notes that homeowners over the age of 55 are the most likely to splurge on kitchens than those under 35. Homeowners between 35-54 years of age spend on par with the average cost of kitchen renovations. Houzz also reports that over 20% of all homeowners who renovated their kitchens last year spent over $35,000. The report also reveals that most homeowners in Australia plan for a budget ranging from $10,001-$20,000 and $20,001-$35,000 for kitchen renovations. Keep these estimates in mind and budget for your expenses accordingly. While you shouldn’t need to spend more than the average cost, it is always wise to budget for unforeseen expenses. If you feel that the average cost of a kitchen is a little on the high-side, don’t worry. You can save a considerable amount of money if you know where to shop. For this, look no further than us here at Ross’s Discount Home Centre. We’re your one-stop-shop for kitchens in Perth. 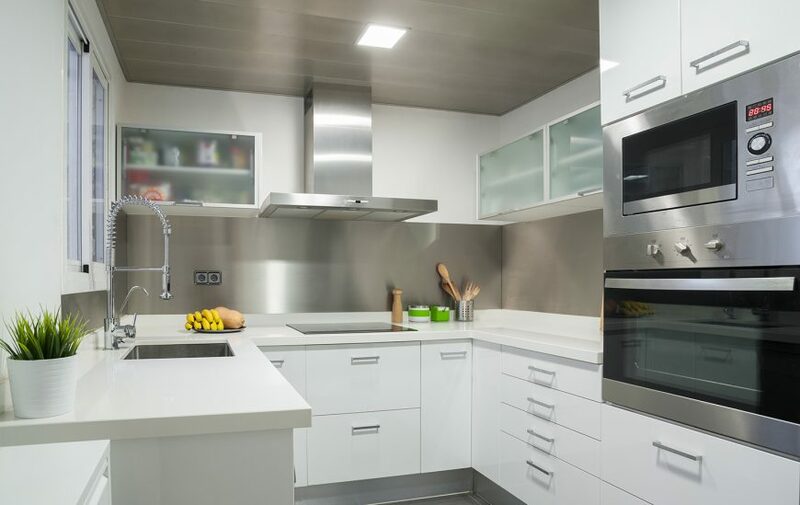 We offer a full range of kitchen cabinets, benchtops, tapware, sinks, packing and finishing panels and other kitchen accessories, and best of all, we’re much cheaper than other kitchen manufactures in Perth. All of our products are manufactured to the highest standards of quality and are available at the lowest possible prices. Thereby shopping with us, you can save as much as 50% off the average cost of a kitchen. Now that is massive!! In fact, you can purchase everything you need for a complete kitchen renovation, including appliances, for as little as $8,000. You won’t find the same quality kitchens in Perth at prices cheaper than what we have to offer. You will find everything you need for your kitchen renovation at our Guildford showroom, or on our online store. Our products are always in stock and available for immediate dispatch – and free shipping is offered for online orders to Perth Metro! Whether you’re looking for tiles, preassembled kitchen cabinets, benchtops, sinks, appliances or accessories, you can count on us to offer goods at unbeatable prices. So, go ahead, take a look at our online store and shop from us to complete your entire kitchen renovation for just $8,000! If you’re renovating or building a new kitchen in 2018, then you should have an idea of how much it will cost you. This depends on your preferences and the products and appliances you purchase. Houzz reports that the average cost of kitchens in Australia come out to be $19,300. Most homeowners keep a budget between $10,001-$20,000 for kitchen renovations. To keep your renovation costs to a minimum, shop from a reputed retailer such as Ross’s Discount Home Centre. We offer a full range of kitchen products, and you can find everything that you need at our store. By choosing us, you can save up to 50% on the costs of kitchens in Perth and complete your renovation for as little as $8,000! Start shopping for your new kitchen today. Click here to see our full range of kitchen products.